Do you miss the pop/punk sound of Jason Dunn singing with Hawk Nelson? Well you’re in luck, because We Are Leo’s label debut album Fightback Soundtrack, which releases on Dream Music Group, is the closest that we as listeners are going to experience that is similar to what Jason Dunn made popular. Do you remember the band? Well that’s because Ben Kascia formerly from skillet produced their debut independent EP Hello…and now the band are releasing their first full album of pop/punk goodness! With a strong faith in Jesus embedded throughout, electronic, danceable beats, and inspiring lyrics as well, the four friends are well on their way to being extremely popular and well respected in the future. Though there are some cliché and cheesy lyrics, other moments are brilliantly produced and sung, leaving this 12 track album being the biggest surprise (in a good way) to release in October so far! Opening the track list is the track with a name sounding like a twitter hashtag. “Yours4Sure” starts off with a catchy piano riff, and is a simple invitation for us to dance in joy and celebration with the knowledge that we are God’s, forevermore! As pop as the album gets, this track is a fantastic opener, compete with a stripped down electronic keys and synth led instrumental bridge that is just pure genius. Though, Jesus isn’t explicitly referenced, and you could think that the band are singing to a loved one, I believe that it is this universal meesage that makes me love the track all the more- we all need God and our family and friends in our life, and that indeed is something that we can celebrate, as ‘…on this open road, my heart beats hope under the sapphire blue, and I have it all because I have you…’. Throughout the rest of the album, We Are Leo show us why their one of today’s rising artists, with encouraging lyrics and dance beats galore, all pointing to the Saviour Jesus Christ. “Captivated” is a thoroughly fun and enjoyable offering (with a rap included to add depth), and David Duffield’s vocals reminding me of Adam Young of Owl City. With remix effects and explosive beats forming the backbone of this song musically, we are met with an admission that ‘…You’re redefining what love means to me, and it’s perfect timing and I’ll always be captivated by who You are, heaven reached down and captured my heart…’, a revelation that we all can understand as Christians. God’s creation and His very love for us should be captivating, and this simple truth of the nature of God has me tapping my toes in gratitude and joy along with the band! “Phoenix” is next, and the band tackle the concept of rising from adversity through imagery and metaphors (specifically of a phoenix and other forms of comparison with fire), driving home the point that Jesus brings us new life, but with that we need to die to our old self, hence our new lives springing out from our old life like a phoenix out from the fire. Driven with strong keys and synth, this mid tempo anthemic melody really highlights David’s stirring vocals, kudos to the band for creating a gem! New Zealand rap/pop rock band Rapture Ruckus then join the band as guest vocals on the title track, a ball of energy and a fun melody of pure pop goodness, with plenty of catchy hooks to keep us interested and ready to dance. It also doesn’t hurt that it brings back nostalgia as well, with the song reminding me of an 80’s disco pop dance tune played in clubs and bars. Thematically, the song speaks about chasing your dreams and never quitting because God is on our side and He will never give up on us, and it’s a great message to impart to listeners! “Epic”, truly lives up the name of the song musically, as we are bombarded from every angle with plenty of synth, drums, hand claps and guitar. However the lyrics seem to be supercficial (‘…tonight is gonna be epic, now that our heart’s are closer…’- really? ), even though we know the band’s hearts are for God. Nevertheless, the song’s catchiness and contagious beat, reminding me of Group 1 Crew’s “Live It Up”, almost makes up for the lyrical mishap! Rounding up the first half of the album is “Diamonds In The Dark”, a radio friendly pop rock mid tempo guitar led track, where the band covertly remind us of God’s faithfulness and His immense love for us, and His hope that we can and will shine like diamonds for His glory. With the synths still creating a pop/remix/dance/electronic sound consistent with the band’s previous songs; the high octane song sounds like it could be in a movie during the climax, and outlines how it is our duty to lift God’s name up, and with the life’s He’s promised, how could we not? The song that comes out from left field, in terms of music style, is “Amnesia”. With the lack of instrumentation being probably a symbol for the topic of the track- we need to strip away all of the noise and rely on God so that He can help us, this song is just as much a testimony song as it is a warning for us not to be wooed by the desires of this world, but instead to follow after Jesus and associate ourselves with our fellow brothers and sisters in Christ. As David fervently and vulnerably cries out in the chorus that ‘…when I‘ve gotten myself so lost, you found me right where I was, and cured me of amnesia…’, we are gently given reassurance that Jesus is with us, and He will help us if we answer Him and surrender to His will. Well done guys for including a track important to them regardless of genre. While the pop/electronic/remix like upbeat “Fire Inside You” is sung from God’s perspective, where David outlines that ‘…I’ll find you when you’re lost, I’ll catch you when you fall, over and over and over and over again…’, a welcome and much needed reassurance and hope that we are not alone going through life; and the acoustic country influenced slower paced, much more reflective and mellower “Yesterday’s Gone” looks inwards and over the years that may be painful, with the intention of understanding that we can’t change the past but instead should move forward, with the help of God’s hand guiding through the issues; it is the last few tracks that completely win me over, and turn me into a true We are Leo fan! “You’re The Best Thing”, the album’s first single, has sort of a Caribbean style of flavour to the song musically, and describes our lives with Jesus, that He is the best thing that has happened to us ‘…and I’ll never let you go…’– this song is indeed simple thematically but still effective in its powerful message. Just like many other songs on this album already, the strength of the mid tempo electronic ballad “Northern Lights” lies in the lyrics, where David shows us his prowess as a songwriter. In this case, this song compares the hardships in our life to the winters in the Arctic, and God’s love is interwoven in the metaphor as well, which makes for an interesting song, as we hear that ‘…under the northern lights, Your love will keep me here…’. We Are Leo’s debut album ends with the piano led explosive and anthemic melody “Until Forever”. An inspiring track where David reminds us that we will be with God in heaven and the end of everything, and this this life is temporary, but God last forever; there are metaphors and beautiful imagery and lyrics as well present on this song. It’s a track that I had to simply press on repeat, and I’m sure you all will be captivated and inspired by this track as well! Well done We Are Leo for a heartfelt and poignant debut album with plenty of songs that are impacting and challenging lyrically! So, there you have it. A summary of We Are Leo’s debut album on Dream Label Group. But did the album live up to my expectations? 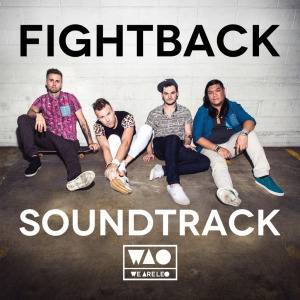 I think that Fightback Soundtrack, though sometimes sounding cliché and cheesy, is recorded well, and is a joy to hear these young men of God create meaningful pop/rock and dance music, that can transcend any belief system. The fact that Jesus’ name isn’t used once in the album, is probably a strategy if by any chance the band crosses over into mainstream music, however apart from that fact, which could confuse some listeners, it’s evident that these guys have immense passion in and love for Jesus. An album not to miss if you love artists like Owl City and Hawk Nelson, the release, though on a tough day with Rhett Walker Band, Aaron Shust, Anthem Lights and Manic Drive as its ‘competitors’ amongst others, is one to look out for and dance to! Well done We Are Leo, I look forward to your next album of pop/rock and dance genius! Previous PostRhett Walker BandNext PostWorship Wednesdays: Chris Tomlin’s “I Lift My Hands”!